Watching Alex Rins selflessly attempt to flag down his fellow riders during FP4 at Silverstone got us thinking about previous positive motorbike videos we've seen to give you that #FridayFeeling. One of the best things about riding is the sense of community and camaraderie shared by bikers. If you’ve ever been unlucky enough to break down at the side of the road, the chances are another biker checked you were ok, or even helped you out if you needed it. From the simple head-nod, to chats with strangers at a garage, online communities or ride outs, the biking world is generally a positive and welcoming place. With that in mind, MCN thought we’d share some positive motorbike videos of times when bikers have acted or been treated with kindness and selflessness, to challenge the negative stereotypes we can encounter. Alex Rins took it upon himself to warn his fellow riders of the danger. However, Tito Rabat was still hit by a bike and required surgery to multiple fractures and a dislocation on his right leg. In case you missed it, here is the clip that got us thinking. A sudden downpour left sections of the Silverstone very wet during the fourth MotoGP free practice session. Alex Rins was the first rider to hit a wet part of the circuit after a very fast (and dry) straight. Discovering that he has no brakes, he decides to bail off his bike at high speed and slides into the gravel trap. Rather than running to check on his bike or jumping on the first marshal’s scooter he could find back to the pits, Rins tried his best to flag down the other riders and prevent any further accidents. Unfortunately, Tito Rabat suffered a broken leg in the incident, but it could well have been a lot worse without Rins’ intervention. This video comes from Royal Jordanian, a London biker who posts videos of his experiences riding through the capital. The bus driver warns Jordanian of a pedestrian crossing between traffic, preventing the possibility of a nasty collision. The Isle of Man TT is famous around the world for high speeds, danger and heroic rides on the road circuit. 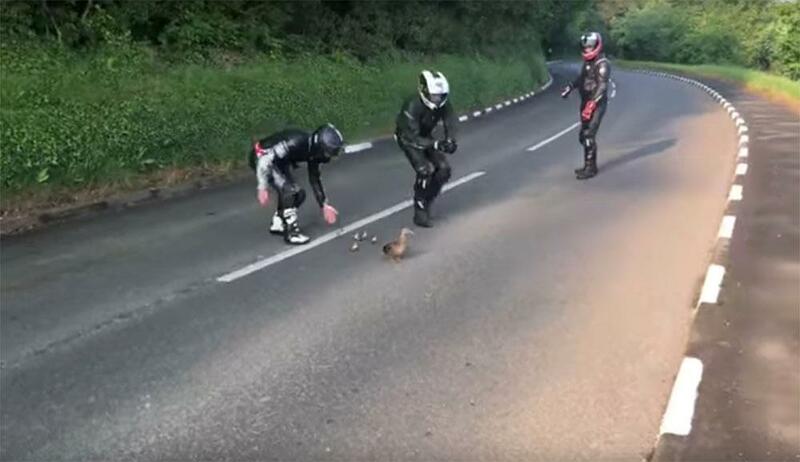 Not all heroes wear capes, but some apparently wear helmets, as these bikers stopped to help a family of ducks off the course. We do not condone dangerous riding under any circumstances, but everyone has the odd lapse in judgement, we are human afterall. The internet is often awash with stories of bikers being banned, given community service or even imprisoned for behaviour deemed to be dangerous. So, this rider probably fears the worst when he gets caught pulling a wheelie in America, but the officer who stops him doesn’t behave the way you might expect. Great to see a measured and empathetic approach to dealing with this sort of thing, we're sure the feeling of relief stayed with this rider for a long time. Back again to Royal Jordanian, this time showing some other road users being courteous and helpful towards him as he makes his way through the traffic, even going above and beyond at times to help him on his way. The way some riders talk, you would think that every single vehicle they encounter on the roads is actively trying to knock them off their bike. As Jordanian puts it himself beneath the video on YouTube: "One simple mistake by a driver and the internet goes into meltdown, while the truth is the majority look out for us and in many cases help us on our way." This last clip is just a bit of fun, there’s no particular act of kindness going on, but there are dogs. These two, complete with their own goggles, seem remarkably calm about being driven around in their owner’s sidecar. That’s probably enough internet for one day. Will failure to declare a speeding fine affect my ability to claim? Win a £2500 biking holiday - just nine days left to enter!